Wisdom is as a flower from which the bee its honey makes and the spider poison, each according to its own nature. This quote appears in Manly P. Hall’s “Secret Teachings of All Ages,” and serves as a stern warning for anyone delving into esoteric practices, and, actually, is a great reminder for all of us, no matter what power we are wielding. For it is not the thing itself that is good or bad, rather, it is what WE do with it that makes it either a constructive or a destructive force. 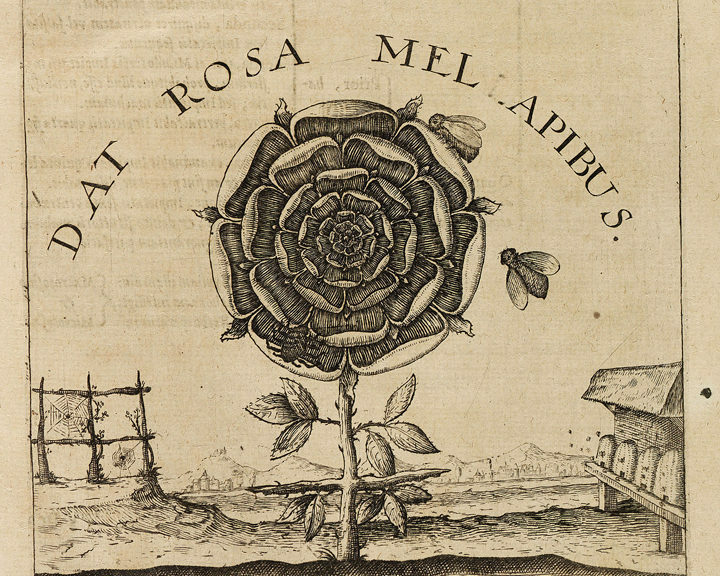 Notice in this harmless looking image, the beehives to the right and the spider webs on the left of the rose. This may also be a veiled reference to the to “left-hand path,” and the “right-hand path.” The caption above only mentions the bees and honey, leaving the spiders to be discovered by those who look more deeply into the image. Most old alchemical drawings would leave something out to prevent the untrained person from understanding the formula, thereby concealing it for only those who know how to read it. This is a very valuable image to behold, along with the warning it contains. Almost anything, or any power that we can access, can be a force for good or a force for ill, depending on the intention and how it is used. Fire can heat our homes or burn them down. A sharp knife in the hands of a skilled surgeon can save a life, or in the hands of a thug, end a life. And, the power of money, which often is labeled “bad,” is the same power that can impoverish others through greed, or empower a community through compassion. This is also the difference between so-called “white” or “black” magic. The magic is neither white or black, it is the magician (and her intention) that makes it so. Intelligence, which is often seen as mostly good, can be used to educate someone or to insult another. Physical strength in the form of a bully can be used to beat someone up, or in the hands of another, lift someone up. Our words – what we say and what we write – can brainwash a nation or inspire the world. As the warning stated, even something like Wisdom, almost always considered “good,” is like the rose in that it can be used with good or evil intent. So try not to be so quick to judge something as being good or bad. For the most part all things which have power and influence can be used either way; it’s in how we use them that determines their quality and effect. Even being loving and caring can be used in a negative way, like if you spoil or coddle a child too much, he or she will then be unprepared to enter the world and manage on their own. So ask yourself often, “Am I making honey with this, or am I making poison?” or “Am I being a bee or a spider in this situation?” If you honestly don’t know, ask for guidance that you become more bee-like and less spider-like in your personal or business relationships. For example, when you are about to confront someone, or if she says, “We need to talk,” take a moment first to conjure up the honey bee image and determine to do your part to make the situation more sweet, and not more poison than it already is. Psychologically, it is also important to keep the warning in mind when you are dealing with your own issues and feelings. The things we say to ourselves about ourselves can be very poisonous indeed. Keep a watchful eye, and if you catch yourself spouting venom, change over to “bee-mode” and produce sweeter thoughts and images in your mind. Negative situations and relationships are rarely if ever solved by adding more negativity and poison. Bees only know how to be bees, and spiders only know how to be spiders, and the rose is neutral. We have a choice to take what we have and use it either for making honey or making poison. So, are you a bee or a spider?